As the consequences of climate change accumulate, many experts expect to see migration away from the world’s most impacted regions as people seek a climate and an economy that better sustains human life. This will add to migratory movements caused by other more traditional reasons: civil wars, natural disasters or the search for better work and educational opportunities. Yet, the prevailing view is that migration is a sort of last resort when it comes to adapting to climate change. Migration is less desirable that in-situ adjustments, e.g., to agriculture or urban environments. Migration also is not easy: it requires financial resources and, usually, established social contacts in the recipient country. These resources will likely limit the amount of adaptation that can be achieved through international migration, particularly in the poorest countries of the world. We do not yet know how influential climate change will be as a driver of migration in the future, but we do know—and we can measure—how much current migration affects the exposure of people to climate change. Overall, this movement is positive; it reduces total global climate risk. Further, there are important details in the movement of people between particular regions and countries. 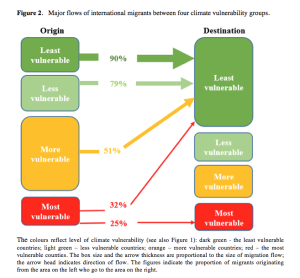 Comparing current patterns of international migration to predicted vulnerability to climate change reveals the extent to which migration is already reducing climate change risk. 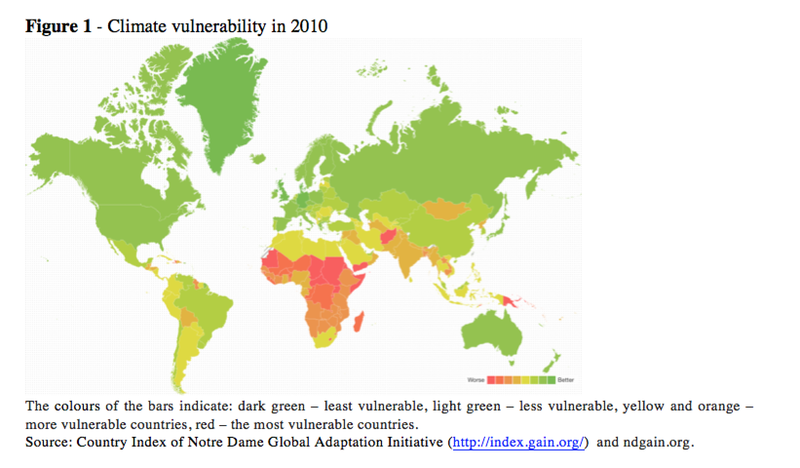 To estimate changes in climate vulnerability due to migration, we used a well-established index called the Country Index of the Notre Dame Global Adaptation Initiative (Figure 1). According to this Index, the vulnerability of a country to climate change is driven by its exposure to changing conditions (e.g., changes in crop yields and distribution of infection diseases), its sensitivity to that change (e.g., food import dependency) and the adaptive capacities that it has, or can put in place, to combat or reduce that risk (e.g., use of fertilizers). Country wealth is not a formal component of the vulnerability, although many of the 36 indicators of climate change vulnerability in the Country Index are positively correlated with national income. The Country Index examines vulnerability across six key economic sectors: food, water, human health, ecosystem services, infrastructure, and human habitat. 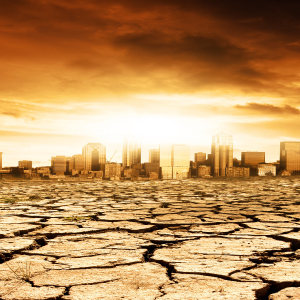 In general, the countries most vulnerable to climate change are located in South Asia and Sub-Saharan Africa, while Europe and North America and Middle Eastern countries are considered the least vulnerable to the effects of global warming. To measure the effect of migration on risk under climate change, we calculated the difference in the Index between the countries of origin and destination of migrant flows between 2010 and 2015. 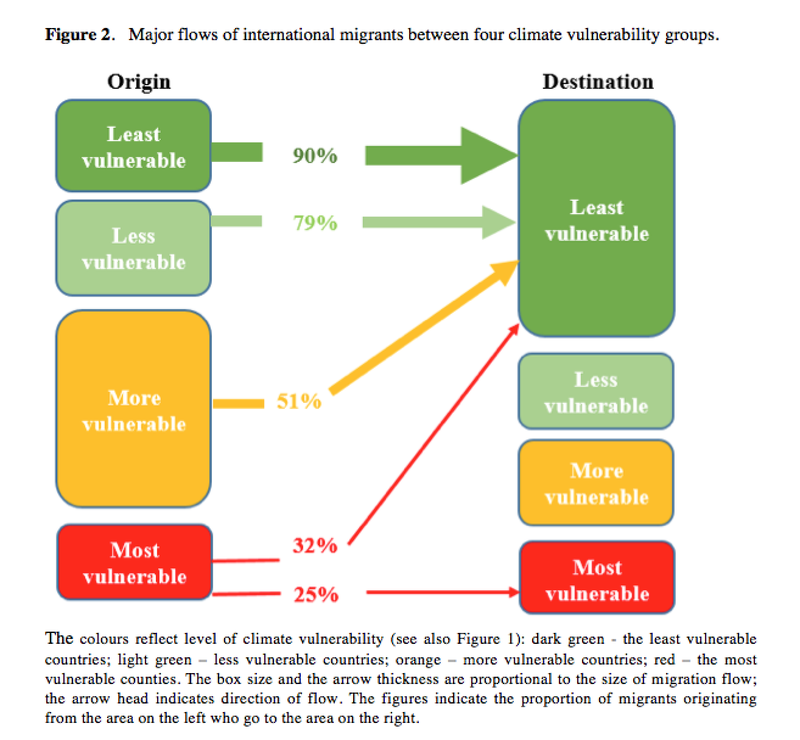 In general, recent migrants have tended to move from countries with higher climate change vulnerability to countries with lower vulnerability (Figure 2). Of the 35 million persons who migrated between 2010 and 2015, approximately 14 million moved away from more vulnerable countries. The majority (51%) migrated to the least vulnerable countries. 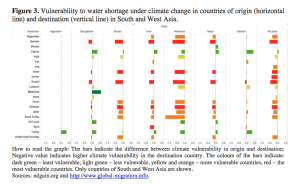 For example, migrants from South Asia, one of the world’s very vulnerable regions (orange and red colour in Figure 2), tend to move to West Asia and the Middle East, i.e., to countries that are less vulnerable to the impact of climate change (light green colour in Figure 1 and 2). However, if we break down climate vulnerability into the particular life-supporting sectors, we can see that migrants from South Asia (e.g. 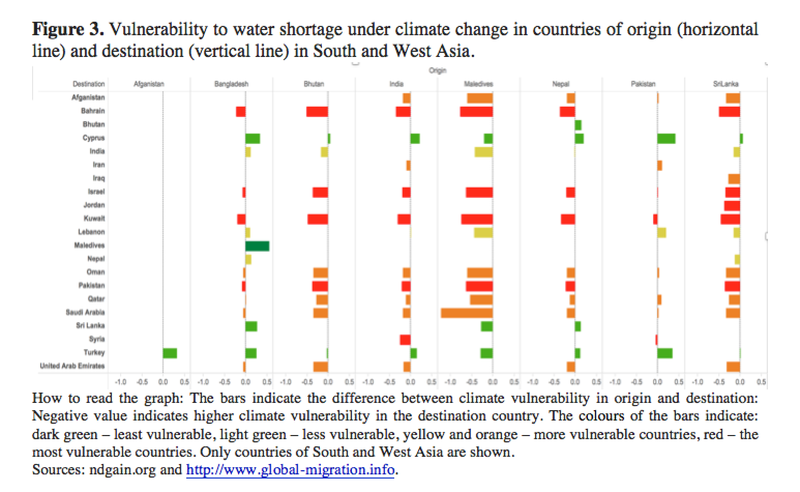 Maldives) tend to migrate to places with greater vulnerability to water shortage under climate change (e.g., Saudi Arabia) (Figure 3). In another region, migration occurs largely among countries with similar or higher vulnerability. We estimated that about 2.2 million people, about ~6% of total international migrants, move to the most vulnerable countries. In Sub-Saharan Africa, for example, most international migrants move to countries with the same or higher vulnerability score. This suggests that under current migration patterns, portions of Africa (where some of the greatest risks of climate change appear) are geographically trapped. One such example is the current refugee crisis in South Sudan, where 1.6 million people are forced to cross the border to countries with similarly high vulnerability to climate change (Uganda, Kenya, Central African Republic, Democratic Republic of Congo, Chad) (UNHCR, 2017). According to the Country Index, the United States is the fifth least vulnerable country in the world, thus reducing the vulnerability of many incoming migrants. But important vulnerabilities within the US should not be overlooked. Many migrants to the US arrive in urban areas, often in coastal regions which are exposed to significant climate risks. In many cases, migrants also lack language skills, income and knowledge of available resources (health insurance, housing), which heightens their particular vulnerability to climate risks, including extreme heat, flooding, or cold. These sub-national variations need further exploration. In stepping away from the Paris Agreement, President Trump denounced the Green Climate Fund, an account through which wealthy countries help the most vulnerable nations adjust to climate change. With fewer funds available for in-situ climate change adaptation (e.g., building climate-resilient infrastructure), we may see both trapped populations in vulnerable countries and more desperate people on the move. The time has come to acknowledge that migration is a strategy for reducing the risk of living in highly vulnerable places. Closing borders to migration restricts this adaptation process and increases vulnerability to climate change worldwide. Reducing climate risk through human migration can be a positive thing, and proactive planning for migration could facilitate this process. Whether those migrants will be welcomed in the countries where they seek refuge remains to be seen. Grecequet M.; DeWaard J.; Hellmann J.J.; Abel G.J. (2017) Climate Vulnerability and Human Migration in Global Perspective. Sustainability, 9, 720. UNHCR (2017), Refugee crisis in South Sudan now world’s fastest growing.